For more information about this Proven Safety Countermeasure, visit the Office of Safety's Intersection Proven Safety Countermeasure web page. Source: CMF Clearinghouse, CMF ID 1410. Backplates added to a traffic signal indication improve the visibility of the illuminated face of the signal by introducing a controlled-contrast background. The improved visibility of a signal head with a backplate is made even more conspicuous by framing it with a retroreflective border. Signal heads that have backplates equipped with retroreflective borders are more visible and conspicuous in both daytime and nighttime conditions. This treatment is recognized as a human factors enhancement of traffic signal visibility, conspicuity, and orientation for both older and color vision deficient drivers. This countermeasure is also advantageous during periods of power outages when the signals would otherwise be dark, providing a visible cue for motorists. 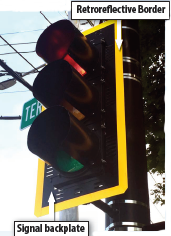 Transportation agencies should consider backplates with retroreflective borders as part of their efforts to systemically improve safety performance at signalized intersections. Adding a retroreflective border to an existing signal backplate is a very lowcost safety treatment. 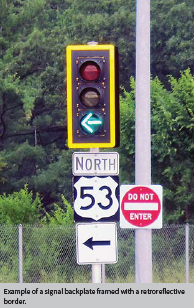 The most effective means of implementing this proven safety countermeasure is to adopt it as a standard treatment for signalized intersections across a jurisdiction.